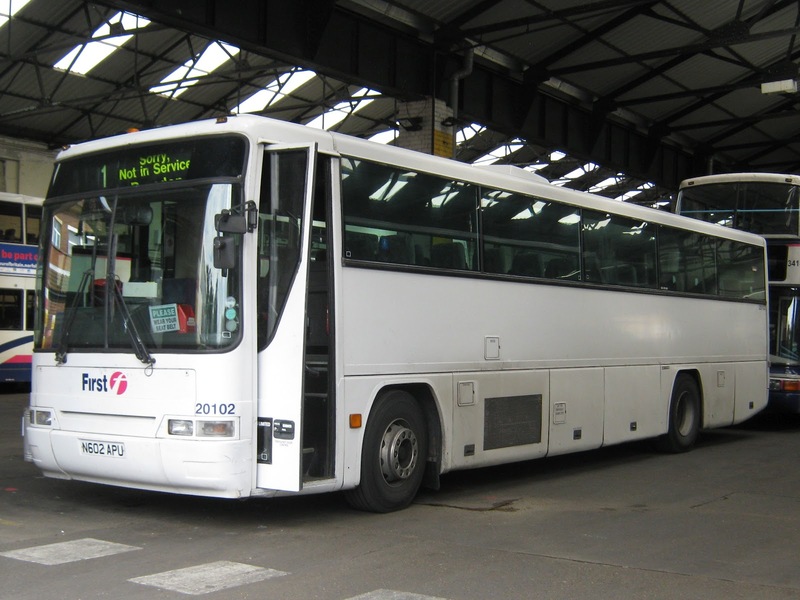 Regular contributor Tim Miller snapped T812RFG in the Beccles company's yard; which now leaves just T811RFG out of the foursome to arrive for attention. The five are former City Of Oxford Irizar Century bodied Scania K114's OW03LFK, OW03LFN, OW03LFP, OW03LFR and OW03LFS. A further three were noted at Konnectbus premises in Dereham last weekend waiting delivery; they were also Scania K114s - Irizar bodied OW03 LFX and EF53 OXF plus Jonckhere bodied OC02 OXF. 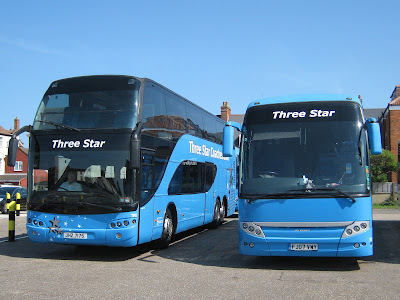 Tim Miller reports that the second of the four former Brighton & Hove Trident has arrived at Car & Commercials yard. T815RFG is seen at the Beccles site having arrived there around 2.30 yesterday afternoon. Finally, Tim reports that an hour earlier Scania L113CRL/ Wright Axcess Ultraflow 416 R81EMB was outside ready for collection following repair. Less than two hours later I noted her entering Market Gates bus station ready to resume duties sporting a shiny new front end! Four coaches from the Alfa Travel fleet were present at the town's Beach Coach Station shortly before 2pm this afternoon. 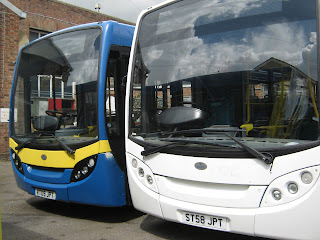 Two were parked side by side; they were Volvo B12B 44 PN07LLJ and Dennis R410 35 PN05AMV. 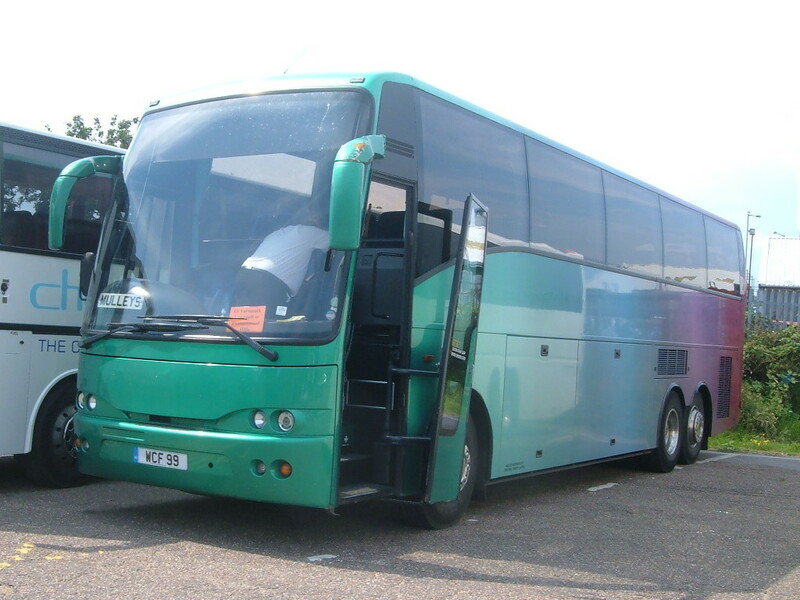 Both coaches have Plaxton Paragon bodywork. The others were Dennis R410 28 PN04NMV and Volvo B12B 41 PN07LLE. Two Shearings coaches were also on site; blue Setra 315 BK11CPE and Volvo B12M Grand Tourer liveried 603 MX04AEC. Ipswich Buses Scania N94UD/East Lancs OmniDekka 61 PJ54YZU was also at the coach station. 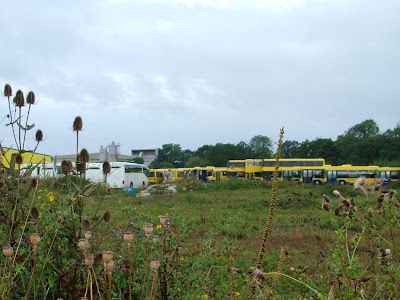 It's only recently that Ipswich Buses have started parking their buses there - previously they laid over at First's Caister Road site. 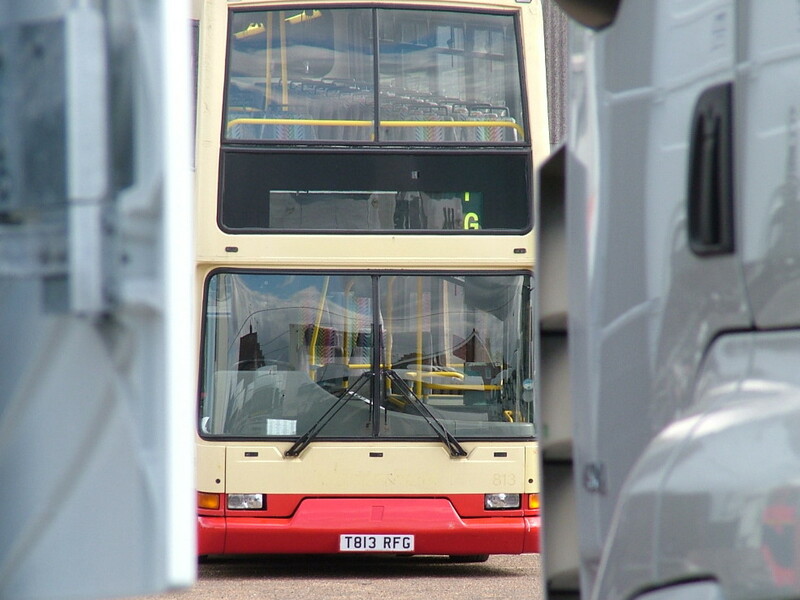 Beccles based AnglianBus has secured a significant number of Suffolk school contracts starting this September following an aggressive tendering process. 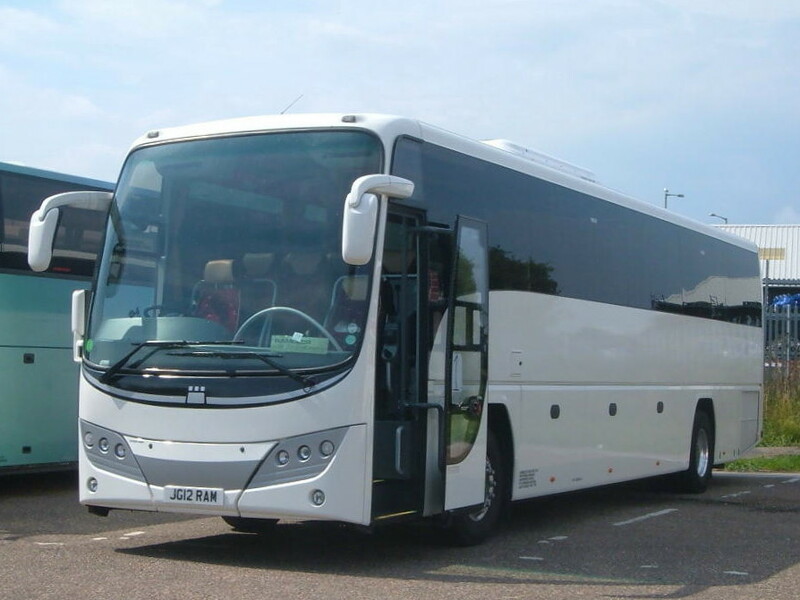 A number of Irizar bodied Scanias have been acquired to undertake the work with at least five being noted at Anglian's Ellough site on Sunday by regular correspondent Tim Miller. Unfortunately the picture has been taken from a distance but, nevertheless, the new vehicles can be discerned on the left hand side of the photo. More vehicles are thought to be on their way as it has been suggested that more than five vehicles will be needed to service these contracts!! It transpires that all will be sourced from Brighton and Hove and the first was noted by regular correspondent Tim Miller at Car & Commercials of Beccles on Wednesday. 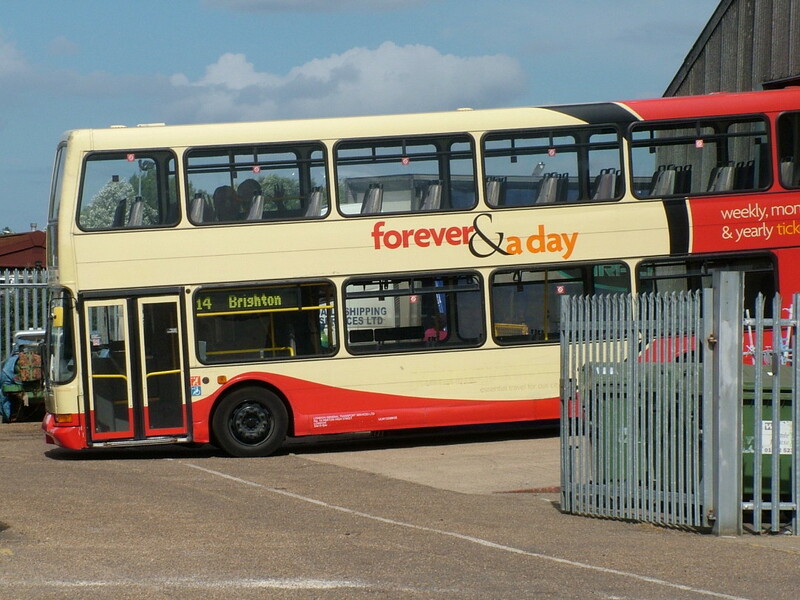 Brighton's T813RFG, which has London General legal lettering, is pictured in their very busy yard! My appreciation goes to Tim Miller for the report and pictures. Thanks also to Neil Chilvers for the clarification of the location. 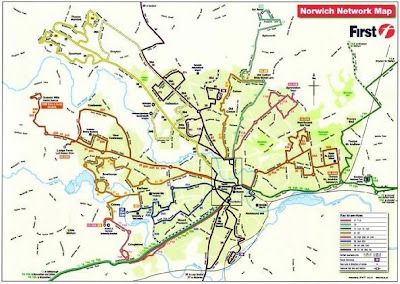 The Norwich bus network is set to be given a big revamp next month, it was announced at yesterday's launch event by Norfolk’s main bus operator First. 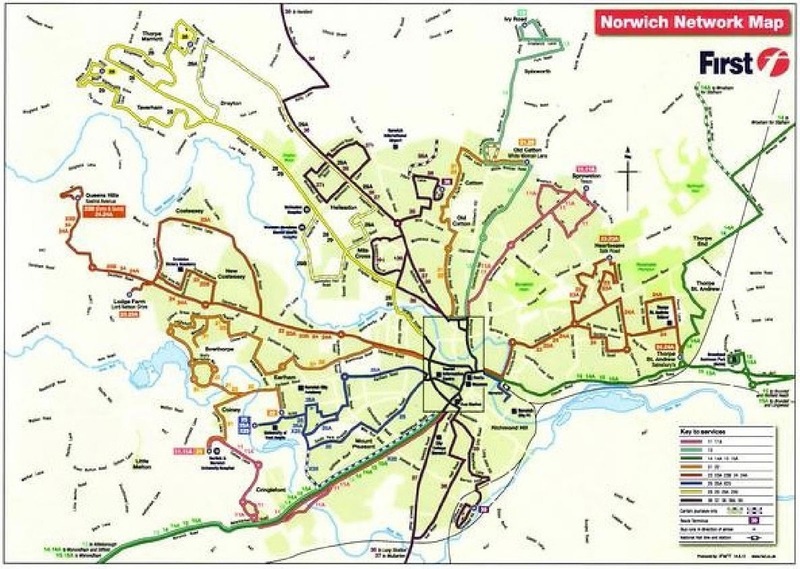 The new network, which will be operated by the newly-named First Norwich, has been colour-coded in an effort to ‘simplify’ the city’s network for passengers. First are hoping the new network will further improve punctuality and offer a better service, using the eight differently coloured routes, from Sunday, September 23rd. 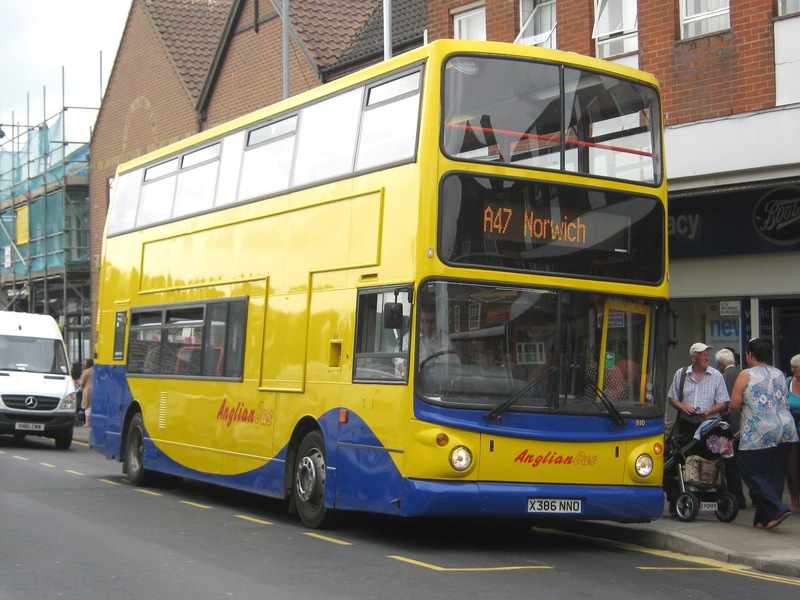 Normally the preserve of a Solo, 195 (P803BLJ) worked the 10:00 from the Suffolk town and the 11:00 return providing north Suffolk villages with a shopper service. 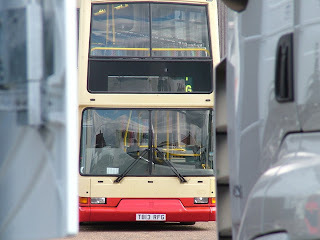 The Volvo B10M is seen on Church Lane in Gorleston awaiting time for its departure from Morrisons. The photo of her at the rear of the depot has been kindly provided by Ryan. Beccles Carnival was held yesterday and the East Anglia Transport Museum sent a vehicle along to take part. 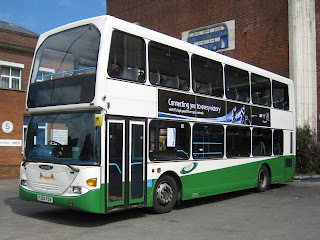 It was in the shape of former Great Yarmouth Corporation Leyland PD2 EX6566. Tim also reports that Anglian's Scania R81EMB is currently at Car & Commercials of Beccles receiving repairs following a recent accident at Brundall. Finally, Beccles is to receive a substantial number of Go Ahead Mercedes Benz Citaro bendy buses for storage at Anglian's Ellough suite. They are currently incurring a cost for storage whereas the Beccles site is owned by Anglian. However, some site works will be required to accommodate them. 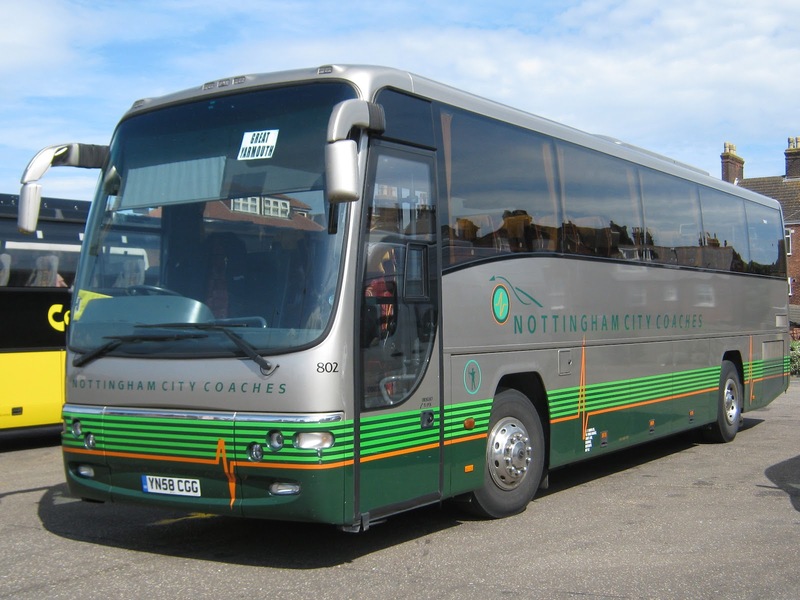 Amongst them was Nottingham City Coaches Volvo B12B/Plaxton Panther YN58CGG. An unplanned visit to Great Yarmouth town centre yesterday saw me observing activity for a few minutes at Market Gates without my trusty camera! However, the mobile phone came in handy and I was able to take a few pictures which may be of interest to blog readers. 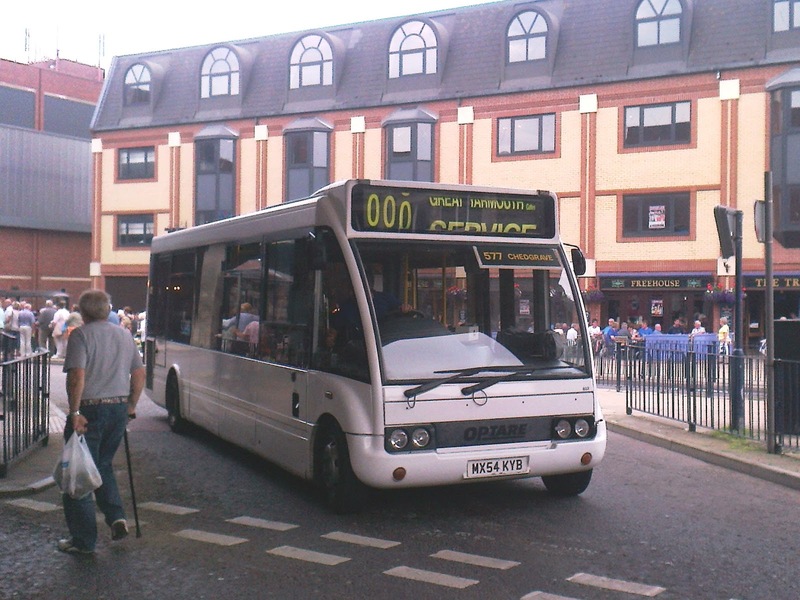 The first is of Ambassador Travel's Optare Solo 602 MX54KYB leaving a busy bus station with the delayed 13:30 577 service to Chedgrave. Simultaneously another of Ambassador Travel's coaches was in Market Gates. This was one of their Jonckheere Mistral bodied Volvo B12Bs complete with National Express branding. FD54DGV was awaiting departure with the 13:40 to London Victoria via Norwich and Bury St Edmunds. 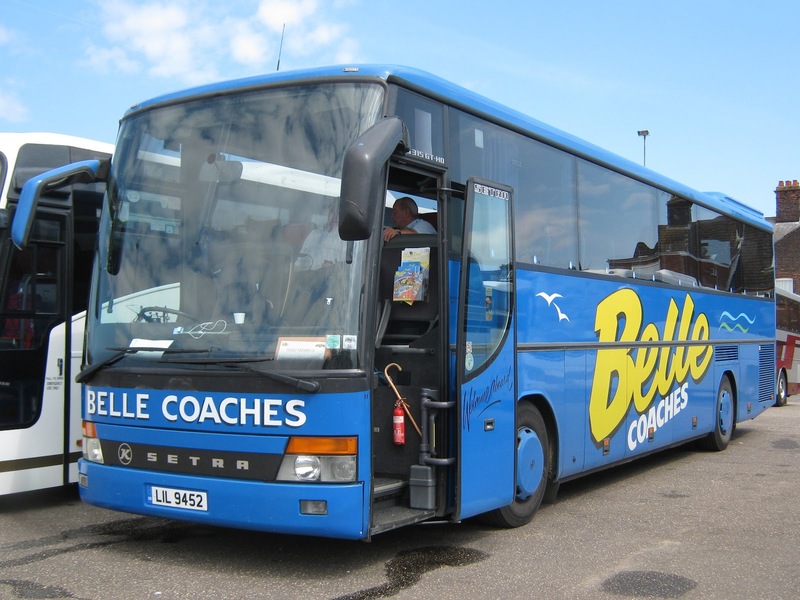 There was actually some 30 coaches there including this Shearings Setra BK10EJJ bearing fleet number 207. The camera on the mobile phone came in handy once more! 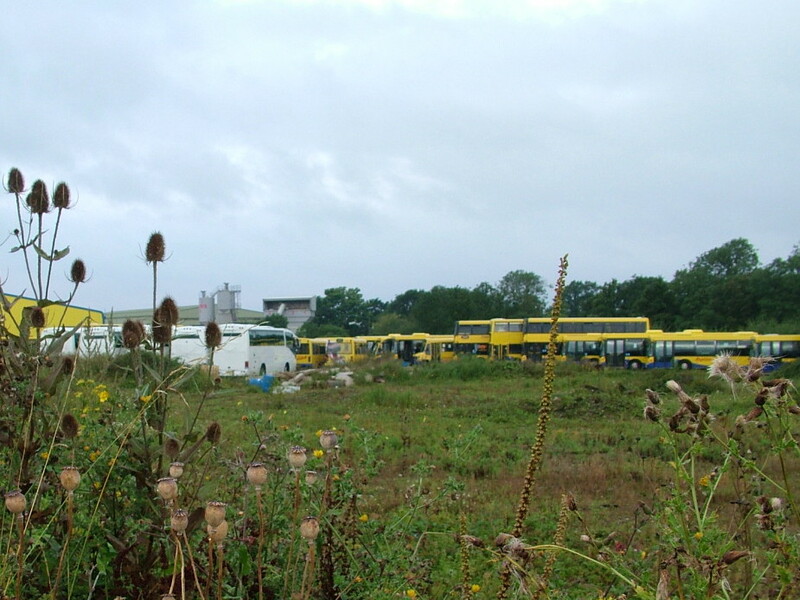 This time they are taken from within the rear compound by James Race on Saturday 11th August. 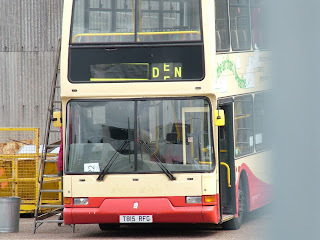 Colleague Syd Eade says that they have been rubbed down and have now received new panels and bumpers prior to repaint. Many thanks to Sid for the report and to James for the photos which are his copyright. A Saturday afternoon visit to Great Yarmouth's Beach Coach Station revealed no less than three double deck coaches amongst those assembled on a warm sunny afternoon. Two of them were from Luton based operator Three Star Coaches with both of its Ayats Bravos maintaining a presence. 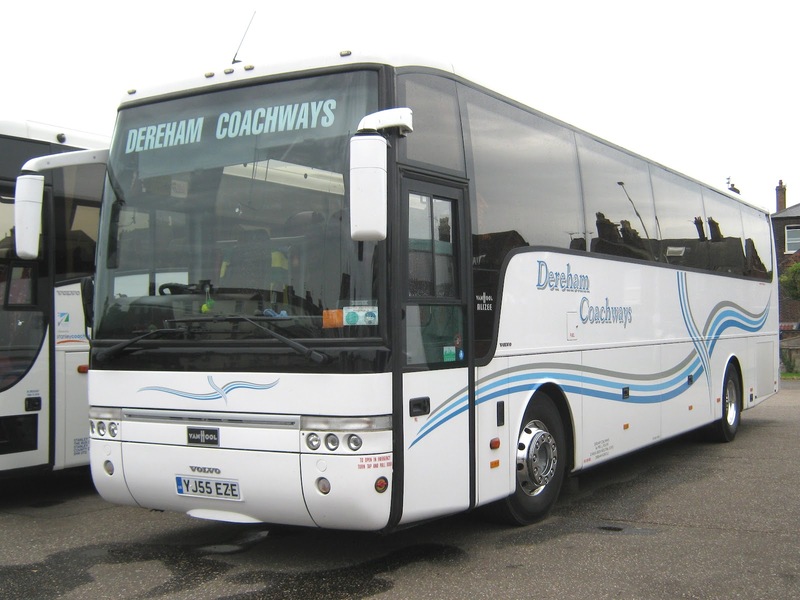 In addition two other coaches from the Bedfordshire operator were there too - representing around a quarter of the fleet! Another noteworthy visitor was a Volvo B10M from Go-Ahead subsidiary Hedingham. L309 (R453FWT), usually based in the Clacton area, is seen here soaking up the sun! 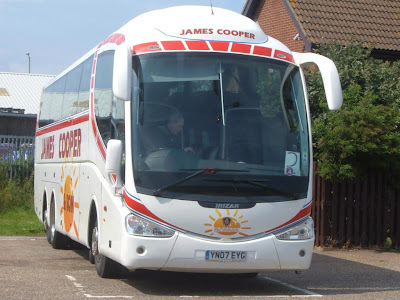 He saw four coaches including James Cooper's Scania/Irizar YN07EYG which was new to Happy Days of Stafford in April 2007. 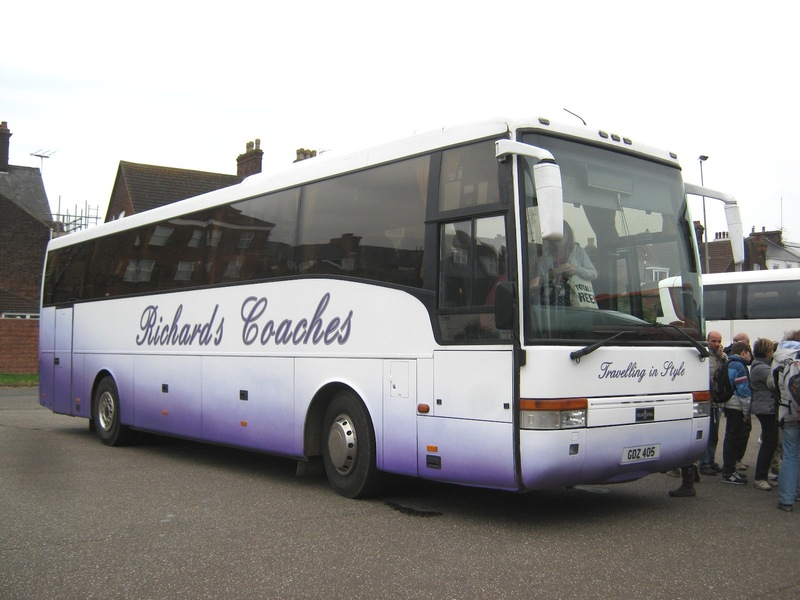 Another notable visitor was Rambler Coaches Volvo B9TL JG12RAM and Tim chatted to the driver who favoured the B13 version over the B9. 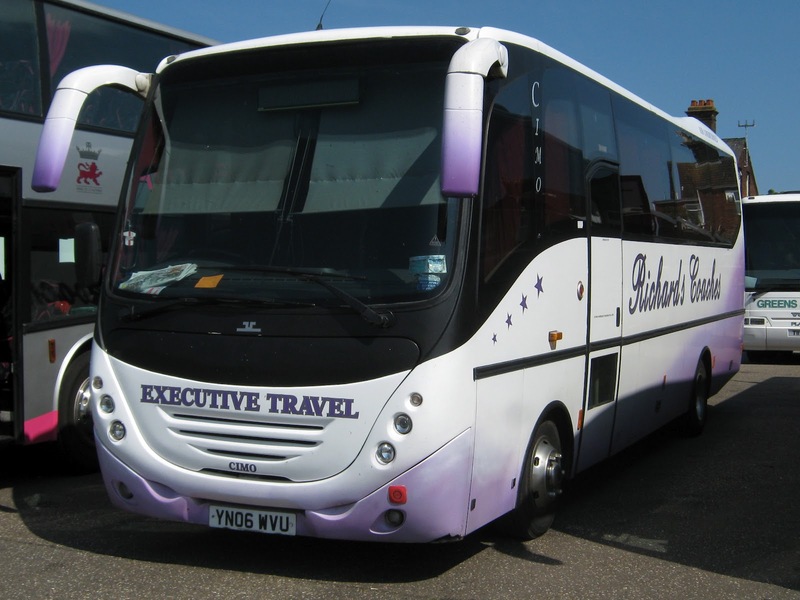 Both of the above coaches were based at nearby Pontins for the whole week. With days passing before my posting on the blog, four posts arrive within 24 hours! Syd Eade reports that he popped into Market Gates yesterday morning and saw two Ambassador operated shopper services the 730 from Reedham and the 577 from Chedgrave arrive. He also reports that it was good to see both the Routemasters on service 3 duties after a short spell with only one on the road; very busy they were too. My thanks to Syd for the report and pictures. All photos are copyright Syd Eade. 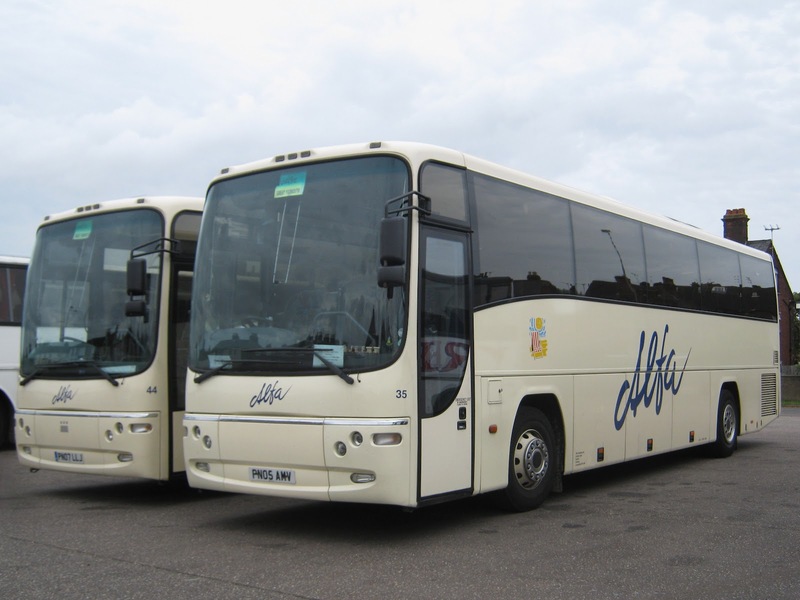 Within five minutes I recorded three of the five Metrobus exiles now operating on behalf of Anglian. All three were either on the 601A or 601 services. 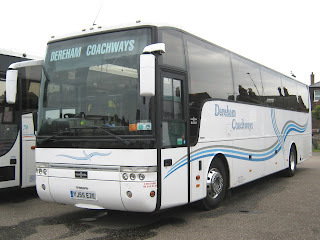 A substantial number of coaches appearing at Beach Coach Station on what is traditionally the town's market day. 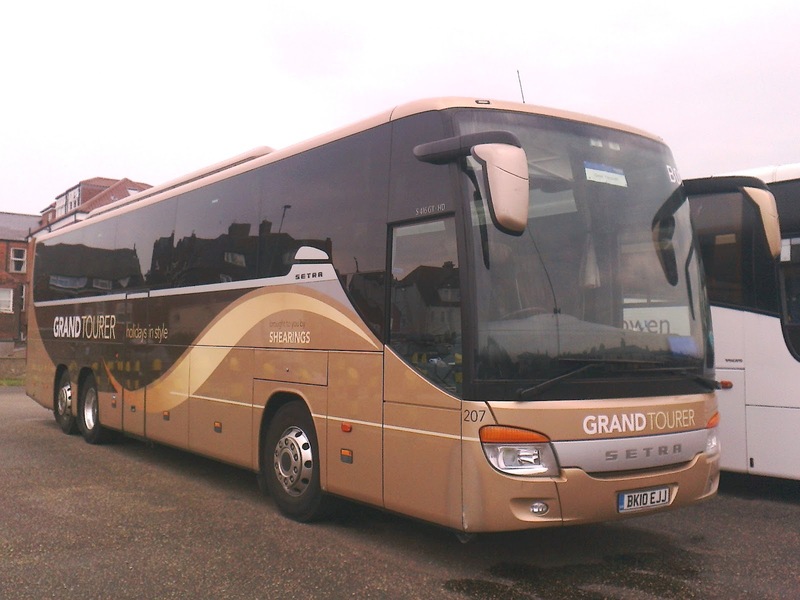 Also at the site was Garfields Executive Travel's YJ11GGF masquerading as one of the Shearing's fleet! Presumably the Beddlington-based operator was leasing the Van Hool to Shearings to cover commitments! 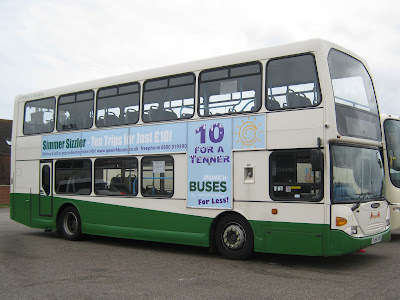 Passing First's Caister Road depot in Great Yarmouth this lunchtime, I got a distinct Ipswich feel about the place! 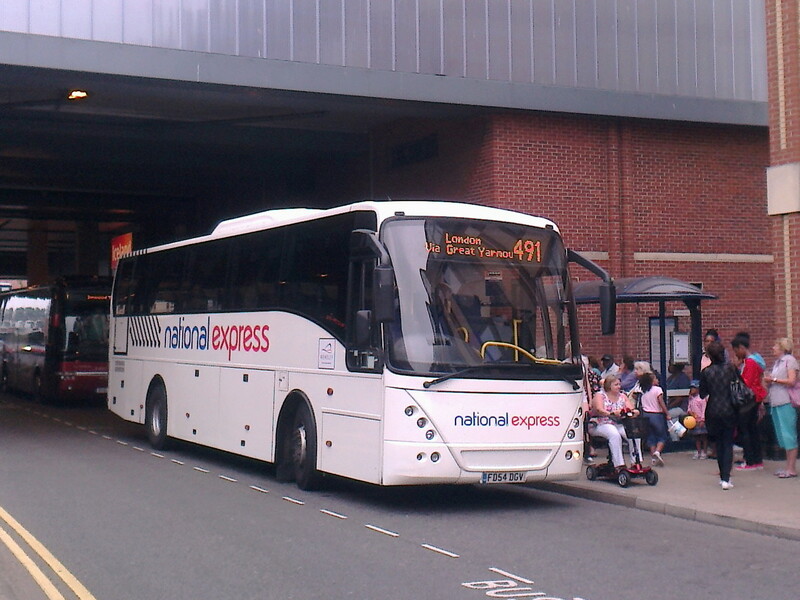 It was hardly surprising as one of Ipswich Buses Scania Omnideckers was parked on the front forecourt. Ipswich No 62 PJ54YZV had found its way there after working one of the regular excursions from the Suffolk county town. For some years now the vehicle working these trips almost always parks up here rather than at Beach Coach Station. Meanwhile, sitting just inside the depot entrance was Ipswich exile 20102. DIRECTOR(s): ANDREW CLIVE WARNES , JULIAN MARK PATTERSON , STEPHEN LESLIE CHALLIS . Other Details: One return journey per day during term time. 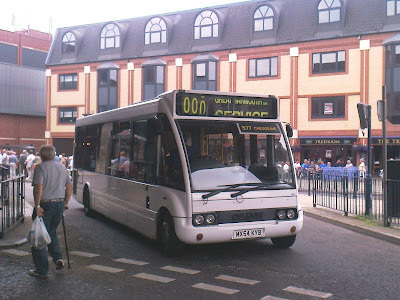 FIRST EASTERN COUNTIES BUSES LTD, ROUEN HOUSE, ROUEN ROAD , NORWICH NR1 1RB, GB Operating between LOWESTOFT BUS STATION and NORWICH, ALL SAINTS GREEN given service number X2 effective from 02-Sep-2012. 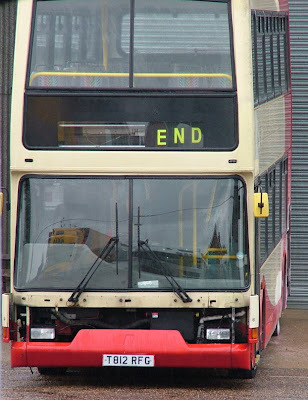 To amend Route, Stopping Places and Timetable. 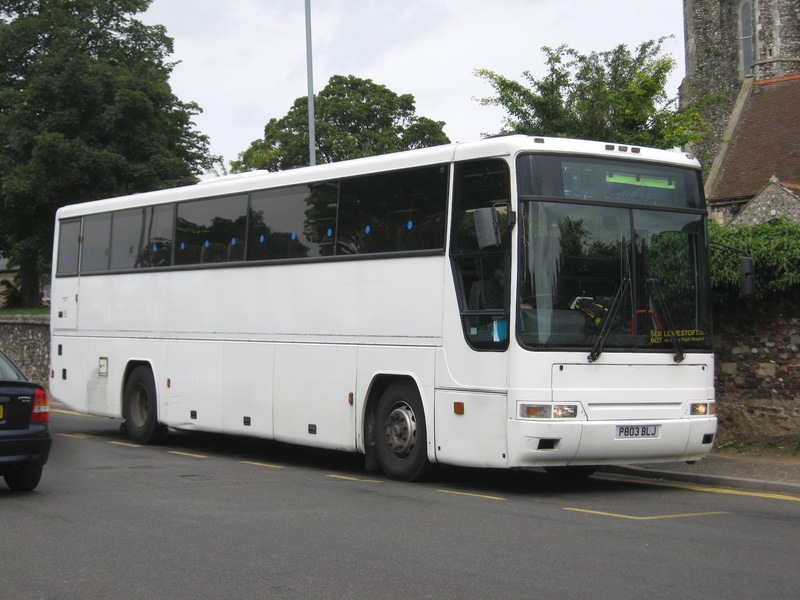 Operating between Newport Beach and West Flegg Middle Sch given service number 809 effective from 02-Sep-2012. To amend Timetable. 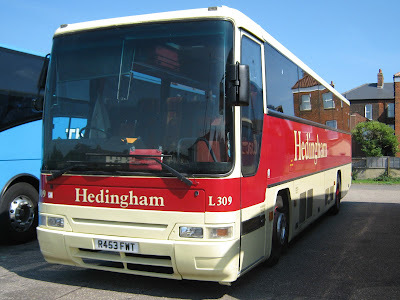 Operating between HEMSBY and MARTHAM FLEGG HIGH SCHOOL given service number 807/808 effective from 02-Sep-2012. To amend Route, Stopping Places and Timetable. KONECT BUS LIMITED, 7 JOHN GOSHAWK ROAD, RASHES GREEN INDUSTRIAL ESTATE , DEREHAM NR19 1SY, GB Operating between Wymondham and Norwich given service number 9 effective from 04-Sep-2012. To amend Timetable. 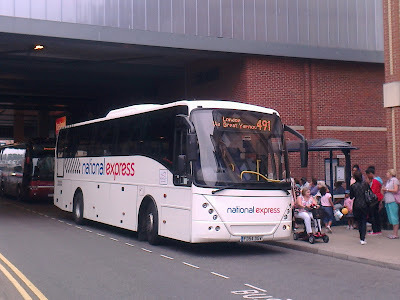 Operating between Attleborough and Norwich given service number 6A effective from 04-Sep-2012. To amend Timetable. 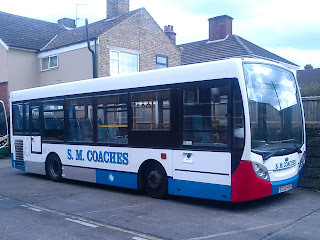 Following the surprise arrival of six ADL Euro 200s at Great Yarmouth's Caister Road, I can at last bring you some pictures of them from earlier today. All six are languishing in the rear compound at the depot and can be viewed from Harley Road through a wire link fence - not very good for photography purposes! 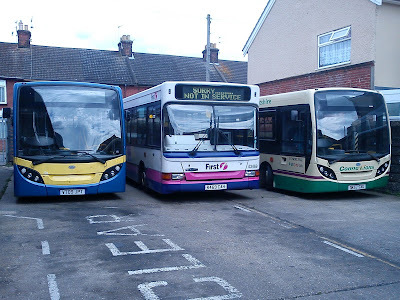 Three of them are in JP Travel livery whilst the fourth (ST58JPT) is in allover white. There is a also posting on Youtube regarding the performance of RT09JPT which did not impress the person who uploaded it. The video can be viewed by clicking here. 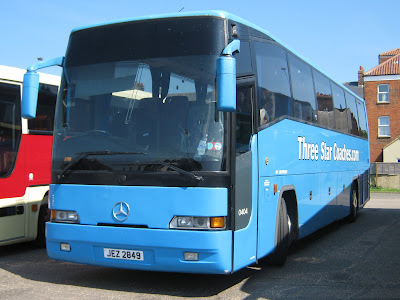 Finally, as I was taking the pictures a passing First driver confirmed they were all destined for use in Lowestoft. At least they will be 'different' from what's operating there now! All have come via Ensign Dealers and will need a repaint into First livery. Grahame was informed that they are for Lowestoft duties with possibly more due for Great Yarmouth. 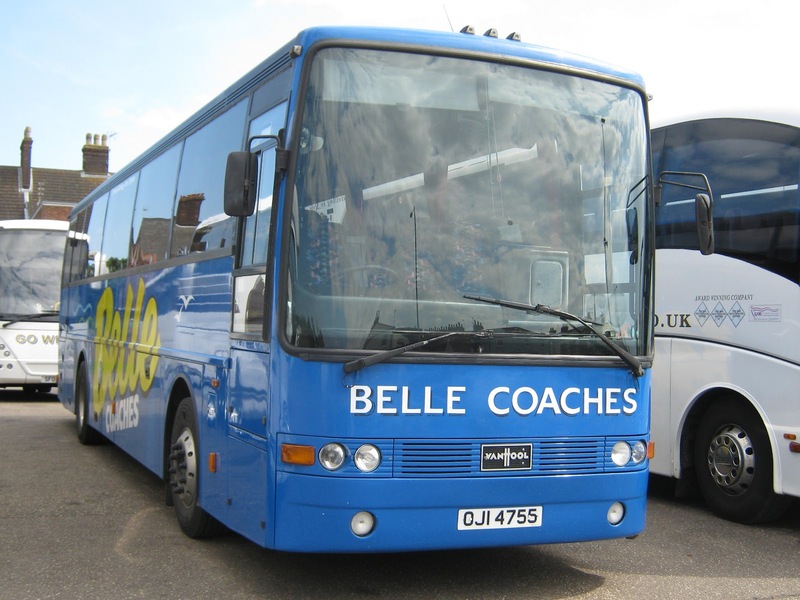 It was one of three vehicles acquired by Marretts Charriots of Aylmerton following the takeover of the Bluebird fleet in September last year. North Walsham operator Bluebird purchased SIL5304 from Crusader Holidays as their E107GOO and the coach is now owned by Nott Johnsons of Wisbech. 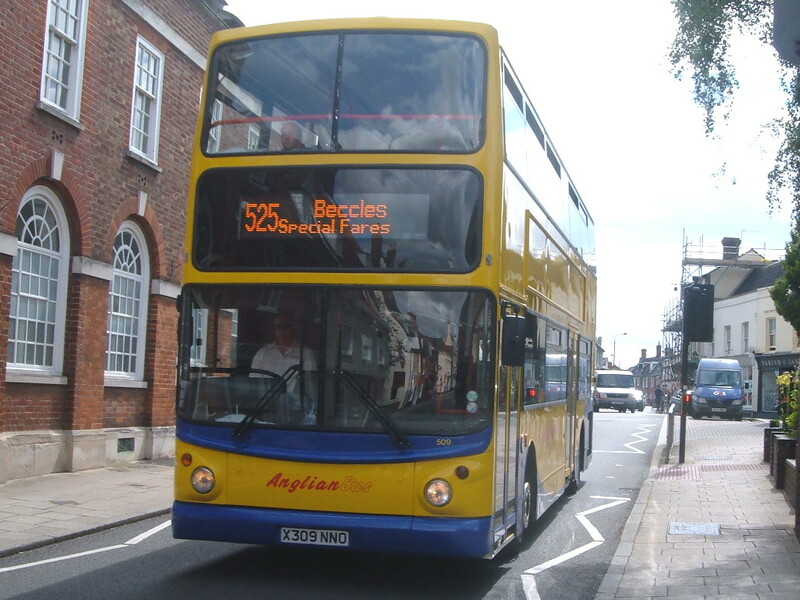 Just after lunchtime today he photographed sister 509 (X309NNO) operating the 525 through Beccles. Trident 508 was also noted out today running northbound on Southtown Road around lunchtime on the 601 to Great Yarmouth. Tim also saw an unidentified Anglian Solo in Beccles today, with the mechanics van following closely behind, on its way back to the depot at Ellough. He believes it was earlier operating the 581 service. 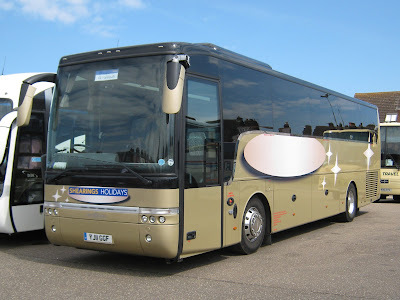 A headcount of coaches at Beach Coach Station early this afternoon revealed a total of 18 onsite together with a handful of minibuses. 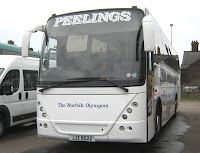 The Dereham operator was represented by Volvo B12M YJ55EZE (above left) whilst Peelings were using B12B JJZ8022 (above right) - carrying a 'Norfolk Olympian' name. Richards Coaches Scania/ Van Hool GDZ405 arrived just after a shower and its passengers are seen leaving the vehicle in the normal English summer attire!